Clydebank’s fine form was ended as they fell to a narrow 1-0 defeat to league leaders Hurlford United on Saturday. Ross Robertson’s late first half goal was all that separated the sides as Hurlford extended their winning run to eight consecutive league games. Bankies boss Kieran McAnespie made just one change from the side that beat Glenafton, with Jack McClair replacing Andy Paterson after the veteran defender failed a late fitness test. Both teams went into the top of the table clash in fine form but it was the visitors who threatened first, with both Calum Watt and Ryan Caddis trying their luck from distance in the opening minutes. While neither side seemed to settle on the ball, Hurlford’s physicality almost paid off after 20 minutes when Ross Robertson fired a shot straight at Waters, before Caddis’ rebounded header crashed off the bar. Bankies grew into the game and carved out their first opportunity midway through the first half. Patient build up play saw Cammy McClair pick up the ball on the left flank and force Hurlford goalkeeper Ally Brown into a acrobatic save to tip the ball over his crossbar. And just two minutes later Bankies should’ve opened the scoring when quick passing saw McClair feed Little who in turn set up Ross Alexander, with the youngster’s curling effort again forcing Brown into a smart stop to keep it level. As the half time whistle approached, Bankies looked like they would go in level at the break when goalkeeper Marc Waters pulled off a fantastic save from Roberton’s bullet header after a cross from the right. But the visitors had other ideas and took a late lead when Roberton spun inside the area and rolled the ball low to Waters right to open the scoring. Bankies were dealt another blow at the break when Jordan Shelvey was forced off with injury as Sean Higgins took his place as Bankies looked to find a way back into the game. Less than five minutes into the second period, Bankies were denied an equaliser when Jack McClair’s left footed cross found Chris Black lurking at the back post, with only the crossbar denying Black. Ryan Caddis then had the chance to put the game beyond the reach of tiring Bankies when he nipped in behind the back line and knocked the ball past Waters, with Michael McIndoe able to slide in and divert the ball wide. The introduction of Del Hepburn and Alan Vezza saw McAnespie switch to a 3-4-3 formation but the Scottish Junior Cup finalists were resolute and comfortably soaked up wave after wave of attack as Bankies looked to salvage a point. Deep into stoppage time, Clydebank went on one final attack as McIndoe fed Black at the edge of the area, but he pulled his effort wide of the post as Bankies fell to just their second league defeat of the season. 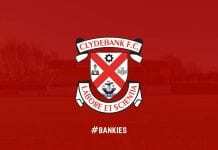 Bankies now head Cumnock next Saturday looking to get back to winning ways, kick off at Townhead Park is 2pm.